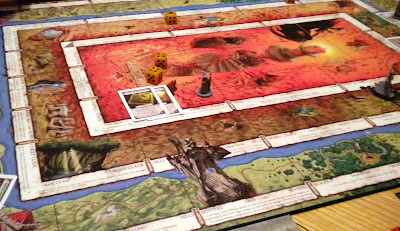 Talisman is a game for two to six players that very much grabs the swords and dragons tropes and runs away with them to make a light-hearted game of fantasy quests. The aim of the game is to reach the crown of command in the centre of the board and use its power to systematically destroy the other players. Each player takes it in turns to role a dice and move their character that many spaces around the board. Characters can travel in either direction within their region and the board is split up into three regions. Characters can move between the regions by a variety of methods. When a player moves to the square they will resolve the action of that square which typically involves taking a random event card. Three to four players is the ideal amount in Talsiman though I've seen it attempted with eight players! The event cards are the main mechanic of the game which may include monsters to fight, treasure to gain or an event that can affect all players. If you come across a horrible beasty combat is a simple affair of rolling a dice and adding your strength or will, depending on the nature of your foe. Another player does the same on behalf of the creature, whoever scores highest wins. If the monster wins the player loses health and monster stays put. If the player wins they take the monster as a trophy which can be traded to boost your character’s strength or will. At the early stages of the game there isn’t much choice in your actions, you usually have the choice between two options of drawing a card. As the game progresses these options open up, undefeated monsters and un-claimed treasure remain on the board, allowing other players to fight the monster or pick up the items respectively. The Necromancer is actually from the Frostmarch expansion and Talisman has a LOT of expansions. Talisman has two main drawbacks. The first is game length. Fantasy Flight suggests a typical game takes 90 minutes, yet most games can easily take over three hours. This is mainly because the game only ends when the players choose to. 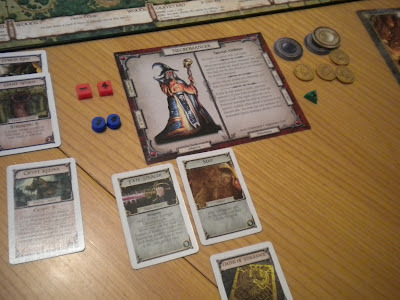 Taking a quest to gain a Talisman and making a grab for the Crown of Command are both choices in the players’ hands. The problem is magnified by the difficulty of the final region. You need a significantly powered up character to be able to breeze through the final section and it’s very easy to die or be teleported away to an inconvenient location. This means that if all the players in the group are hesitant to attempt the final section it can turn into a very long game. Making an attempt on the final region is always dangerous. Thankfully player elimination doesn’t occur until the final section of the game. When you die, unless a player is sitting on the Crown of Command you simply take a new character and start again. All of your equipment and treasure gets dropped where you die so this usually leads to a mad scramble to get to get hold of the best loot. Talisman also has one of the funniest penalties in the game; various effects can turn the player into a toad. The character is replaced by a useless amphibian and all of their equipment gets dropped. The second main drawback is the lack of direct player interaction. While it is true that you can attack other players, or even charm or rob them with some of the characters, the majority of the game is spent playing at your own pace. 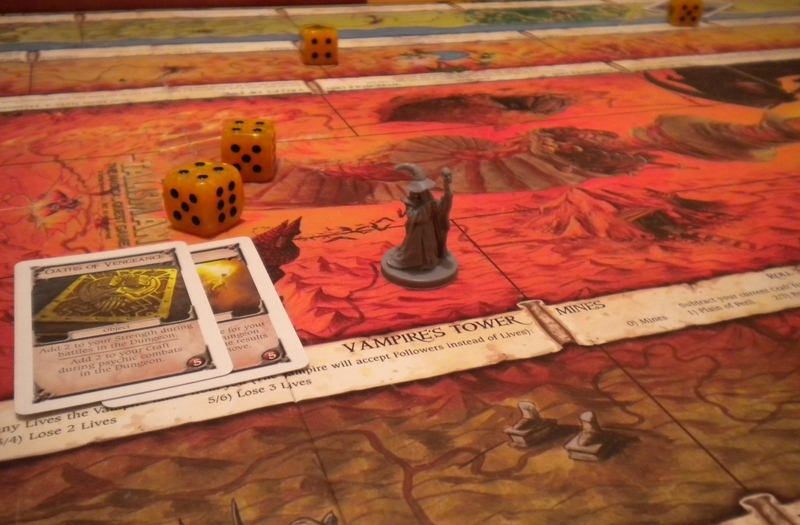 Being overly aggressive opens up the game a lot more and is the way to get the most out of Talisman. You are trying to kill all the other players via the crown of command so why not try it earlier? The Sentinel guards the bridge but there are many more ways to cross the river. Both of these drawbacks are entirely based on how you and your play group approach Talisman. If you are the kind of player who wants deep strategy or meaningful decisions then you’re going to be disappointed. If you’re the kind of player who wants to screw over every other player at the table then you are definitely going to get a lot of fun out of the game. 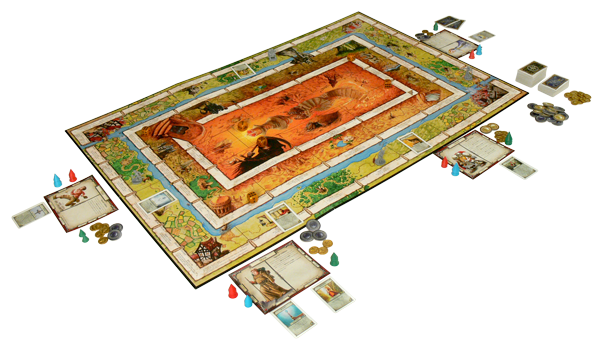 In the end Talisman is a game centred on chaos and randomness. Most turns are based on the random drawing of a card and the next card could be something very useful or it could be a huge dragon ready to eat your face. Your enjoyment of Talisman is going to be based on how much you embrace that chaos and turn it into the tale of your character’s epic quest to rule the world. It’s a game in which the winner or loser doesn't really matter it’s the journey that makes this game fun. I just wish it wouldn’t take so bloody long.